Conquistador is Spanish for “conquerors” and is applied to Spaniard soldiers who explored the New World in the 16th century. In the late 1980’s, the squared circle of the World Wrestling Federation were treated to Conquistadors of a different variety. Gone were the warriors of strategic battle tactics and enter the two individuals who never came close to conquering anything. 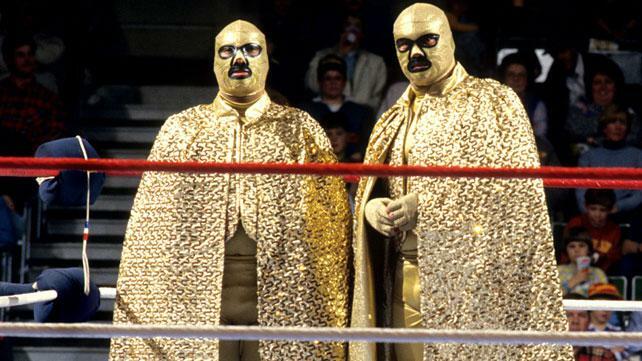 The Conquistadors were a tag team comprised of two masked wrestlers who wore gold boots, spandex gold body suits and gold masks with black trim. There individual names were simply Conquistador #1 and Conquistador #2 or Uno & Dos. Instead of being from a specific part of the globe, they were announced in a mysterious tone as hailing from somewhere in Latin America. Their primary role was to make other wrestlers look good while consistently losing their matches. This spot on the roster is also known as an enhancement guy, job guy or preliminary wrestler. In other words, when you saw the golden duo on your television screen, you already knew the end result. Unlike most wrestlers in that role, they were verbally considered a “competitive” tag team. The men under the mask were José Luis Rivera (Uno) and Jose Estrada Sr. (Dos). Rivera worked many masked gimmicks over his career, but never made it past prelim status. Longtime fans who attended house shows and watched Saturday morning wrestling in the 80’s remember him as that guy who always took a beating. Estrada Sr. gained notoriety in Puerto Rico’s World Wrestling Council. Besides his three day stint as WWF Junior Heavyweight champion, his career in the states was on the same wavelength as his partner, Rivera. His son, Jose Estrada Jr also competed in Puerto Rico and wrestled in the WWF in 1997-1998 as a member of Savio Vega’s heel stable, Los Boricuas. Besides being embroiled in the WWF’s thriving tag team division, they both worked single matches with top names such as Jake Roberts, Bam Bam Bigelow, and The Ultimate Warrior. July 13, 1988 episode of The Superstars of Wrestling featured Rivera wrestling then world champion, Macho Man Randy Savage. Conquistador #2 was at ringside but the power of Hulkamania, in Savage’s corner, kept him at bay as the Madness reigned supreme with an elbow drop from the top rope. This was the first wrestling show I had ever watched. Seeing the Conquistadors locking horns with the Mega Powers convinced me they were top notch players until my friends in the know filled me in. The highlight of their WWF run occurred at the 2nd annual Survivor Series where they were a part of what is now known as a “traditional Survivor Series elimination match” featuring 10 tag teams. The babyface team consisted of The Powers of Pain, The Rockers, The British Bulldogs, The Hart Foundation, and The Young Stallions. The Conquistadors were on the heel team comprised of Demolition, The Rougeau Bros, The Brain Busters and The Bolsheviks. Normally, this line-up served as a foregone conclusion for the Conquistadors quick exit. However, on this particular Thanksgiving night, it was the Conquistadors who made it to the end and were eliminated by the Powers of Pain in the final fall of the contest. Someone told me the Conquistadors went over clean on The Killer Bees on an occasion or two. I’m not sure if this happened but I would like to think my boys could at least conquer Bee Brian Blair and Jumping Jim Brunzel. I know the Conquistadors are not exactly first ballot hall of famers, but they will be a team I will always reminiscence about simply because they were the first tag team I ever saw in the ring. 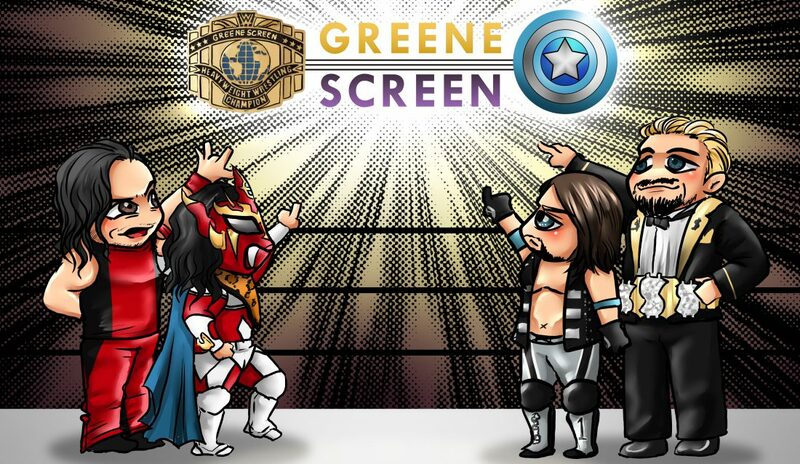 Special thanks to the Internet Wrestling Data Base for their help with this blog post. That 10-team match was one of my favorite from the Survivor Series. I believe during that match, we had the double turn where Demolition went babyface and the Powers of Pain aligned with Mr. Fuji and went heel. Jose Luis Rivera and Jose Estrada are among that group of jobbers (also including Johnny Rodz, Jim Powers, Baron Mikel Scicluna, Brooklyn Brawler) who are easily as famous as some of the regular stars were. Rivera did take a good beating in the ring, so from that perspective, he did his job well. The Conquistadors had ALOT of talent, they could have been champs. Jose Luis Rivera is a two time AWF Americas Heavyweight Champion in Puerto Rico (early 90’s) and he has won a fair share of matches. Jose Estrada Sr. is a former WWWF Lightheavyweight Champion and he held a number of titles in Puerto Rico. Win, lose or draw they always gave their best!!! Jose Luis Rivera is a very nice guy and a family man. I think the WWF was in error by not giving them more championship oppurtunitys.